KIEV, Ukraine -- German Chancellor Angela Merkel said sanctions against Russia will stay as long as the government in Moscow does little to resolve the conflict in Ukraine. “We have worked out an intense plan for the next six years, so that the country meets the criteria to join the EU and to join NATO,” Ukraine President Petro Poroshenko said in Kiev today. “We’re working on a diplomatic resolution to this crisis,” Merkel said today in Berlin. The stance underscores the growing resolve among Ukraine’s allies as violence between separatists and government troops sidelines diplomatic efforts to reach a negotiated outcome. France today ruled out delivery of a warship to Russia. More than 4,300 people have been killed during the almost eight-month conflict in the regions of Donetsk and Luhansk and much of the local infrastructure has been laid to waste in rebel-held areas of Ukraine. The U.S., NATO and the European Union accuse President Vladimir Putin of fueling the crisis by aiding the separatists, a charge Russia denies. Ukraine says Russian troops and vehicles continue to cross the border. NATO Secretary General Jens Stoltenberg urged Russia to pull back its forces from eastern Ukraine and respect a wobbly truce, which has been breached repeatedly since it was signed in the Belarusian capital, Minsk, more than two months ago. He also said that the alliance would stick by a 2008 decision to let Ukraine join if it eventually meets the criteria and decides to do so, even if membership isn’t being discussed now. “We are calling on Russia to stop violating international law and to respect the sovereignty of Ukraine,” Stoltenberg told lawmakers from NATO countries in The Hague yesterday. 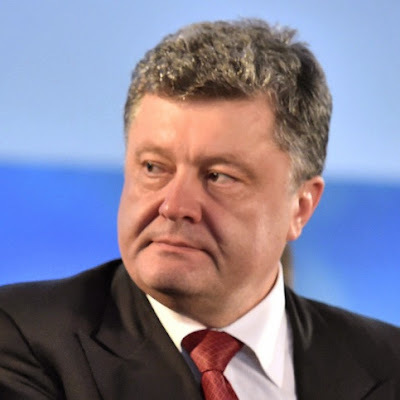 Ukrainian President Petro Poroshenko said the former Soviet republic will decide in a referendum at the end of the decade whether to seek North Atlantic Treaty Organization membership once it completes necessary policy changes. Admission to the military alliance requires agreement by all member states, currently 28. Putin has criticized the U.S. and EU countries for encroaching into former communist Europe, saying they have violated agreements signed at the end of the Cold War and pose a threat to his country’s national security. The decision on its future ties with NATO is for Ukraine alone to make, the foreign ministers of Lithuania and the Czech Republic said at a briefing in Prague. The situation in Ukraine means the terms for delivery of the first of two Mistral warships to Russia “have not been met,” French Foreign Minister Laurent Fabius said on France Inter radio today. President Francois Hollande has said the Sept. 5 cease-fire agreement between Ukraine and the separatists must be enforced before France can transfer the helicopter carriers. Russia’s presence in eastern Ukraine is “unacceptable,” while there are also “serious problems” with statements from Ukraine’s government that it wants to join NATO, Fabius said. One soldier was killed and five wounded in the past 24 hours, Ukrainian military spokesman Colonel Andriy Lysenko told reporters in Kiev today. No clashes were reported on the Ukraine-Russia border, he said, though Russian troops are moving across the border into and out of rebel areas and continuing drone reconnaissance of the conflict zone. Two people died and eight were injured when a shell hit a bus in Donetsk today, the city council said on its website. Three died and eight were wounded in attacks yesterday and the situation in the city is “extremely tense” after a night of heavy shelling, it said. Pro-Russian insurgents attacked 17 locations in the Donetsk and Luhansk regions overnight using mortars, multiple rocket launch systems and shells, the Ukrainian National Security and Defense Council said in a statement. Government forces fired artillery rounds to protect their positions and civilians, and troops near the key port city of Mariupol have “all means to repel the aggressor,” it said. Russia will send 100 trucks with more than 1,000 tons of humanitarian aid to eastern Ukraine on Nov. 28, its eighth convoy to the region, RIA Novosti reported today, citing Deputy Emergencies Minister Vladimir Stepanov. Ukraine has expressed concern that the Russian relief missions may be a guise for funneling weapons to insurgents. The shipments weren’t inspected by the Red Cross or Ukrainian customs officials before entering the country from Russia.